Read Now: The Automatic Call Distributor (ACD) is no longer a core component in the contact center and has become a costly technology that is difficult to manage in a distributed enterprise environment. 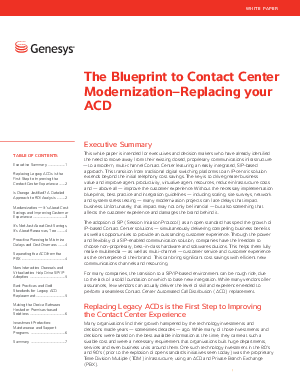 If you are looking to move away from your legacy call center infrastructure — to a modern, multi-channel Contact Center this white paper gives you a blueprint to modernization and replacing your ACD. Get this whitepaper for best practices, and integration guidelines to help you transition to a modern, SIP/IP-based contact center environment. Read Now.